Here at Passcovery we compare different GPUs and present a ranking based on their password recovery performance. What is the problem, its effects and how to solve it – find all the answers in this article! If the headers are not encrypted then what is the compression method? If the “Stored” compression method is used then what is the size of the archive itself? All these factors affect the speed of password attack. 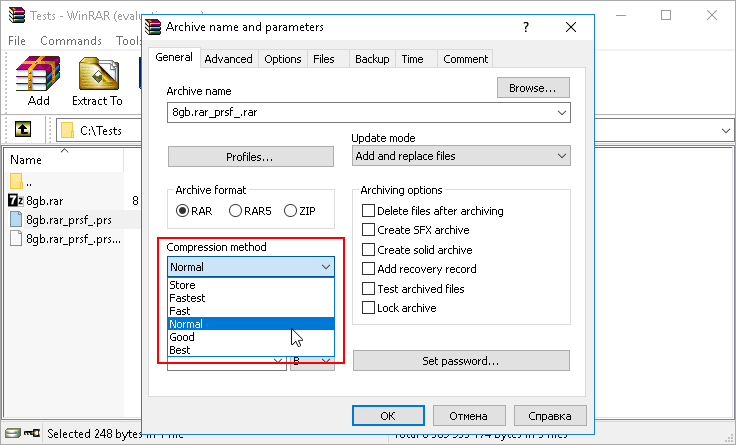 The biggest trouble is the “Store” option – a method without any compression (an archive is a container that stores files in their original size). Let us why it’s a problem. To validate a RAR file it is necessary to convert a password into a key and then decrypt something from the archive and check the result. It’s great if the headers are encrypted. It would also be good if an archive was created with compression (any method other than the “Store” one). Then the key can be used to decrypt either the headers or just the initial part of the archive. It works fast (and even faster on graphics cards). But if the headers are not encrypted and the compression method is “Store” you will have to decrypt the entire archive and compare its checksums with the reference ones. And in this case the size of an archive is of great importance. Do you remember how long it took to archive your huge file? Well, now the process is reverse. When testing each password from a given range the password cracker every time completely unpacks the archive. That means the larger the archive, the more time it takes to validate the password. Recovery of RAR passwords on video cards is associated with one more specific feature – a GPU accelerates “password → key” conversion, but it does not accelerate validation of the key since it is always performed on CPU. And that’s why you might get a freeze while processing a large RAR file. Once GPU receives a pack of passwords to be further converted into encryption keys it quickly returns them to CPU and waits for the next pack of passwords to process. But CPU cannot generate it because it is busy validating a whole bunch of received encryption keys. Again and again it unpacks the archive sequentially verifying each key from the data pack. A side effect of the situation is that the current status of password recovery is not saved until the current block of keys is fully validated. If it lasts, say, two hours and at some point the process stops then the data of all completed checks will be lost and the next time you run .prs-file the check of this block will start over again. There is none. If you are trying to crack a large RAR file and your program window looks like that in the screenshot at the beginning of this article, then your CPU is simply supercharged and stifled with a stream of encryption keys calculated on GPU, which leaves CPU no time to validate them. 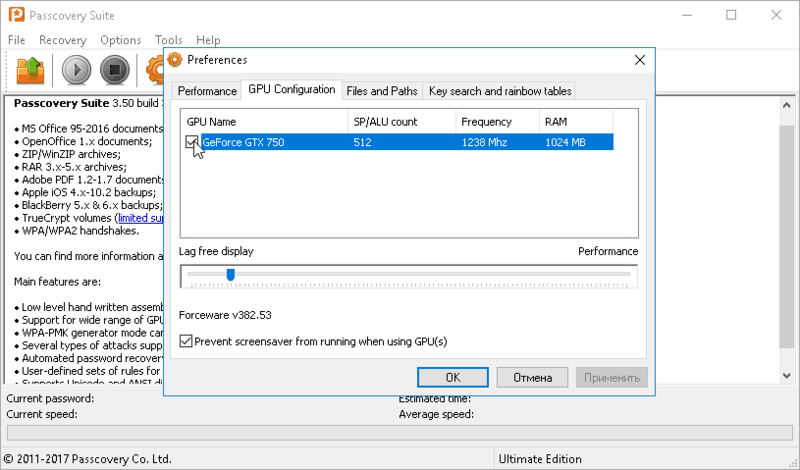 In this situation we recommend that you try to disable GPU (Menu Options → Preferences → GPU Configuration) and check the speed of password attack without GPU acceleration – that is with CPU only (in our demo versions the speed is unlimited). 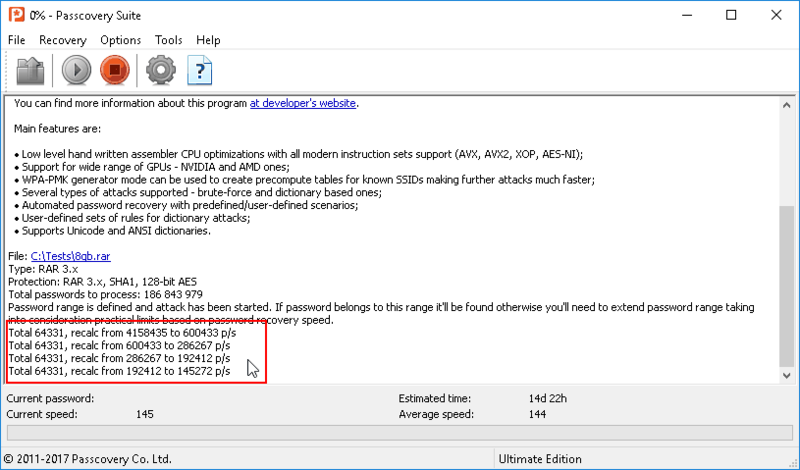 In the case you see that the speed of password attack has [practically] not decreased then there is no point in using a graphics card to crack this archive. In this case an extra bonus that comes along with disabling GPU will be continuous recording of the password recovery status. With different (simpler in structure) archives the situation will be different. In that case the GPU acceleration will very effective. Just make sure you enable it. Learn more and try out our RAR cracking solutions. Demos for Windows x32 / x64 are available on the Passcovery websites.